Today, there was no normal club, instead, I was given a lift by my friend Lawrence's wife, Rowena, to Smoggycon, the last show in the North east of England in 2012! The show was replete with the usual traders..and Demo/participation games. Using the Two Fat Lardies rules.. The lighting was good especially in the theatre hall, the sport hall had a yellowish light, reminiscent of Border Reiver! Durham Pals, and the ACW reenactors were resplendent in the bar, one of the 'danged yankees' even let me handle his Enfield rifle..Nice! Dave Thomas' tempting display, lots of lovely figures! Other traders were catering to players of all ages, judging by the top row! Derwentside Wargames clubs pretty 'Old west' township. This side of the road, pure Hollywood, this side, New Mexico! Just makes you want to walk the walk, six gun in hand! Our friends at Westerhope Wargames club were doing a Romans Vs British WAB game. Happily, The Last Valley were there too and tempted me to spend the last of my money...it was SO worth it though! Rowena, Lawrence and Ian with the owner! See what I mean about the lighting in the Sports Hall! Dashing Dice's game, easily the nicest looking game IMHO! AAG, a Witch, a Witch! 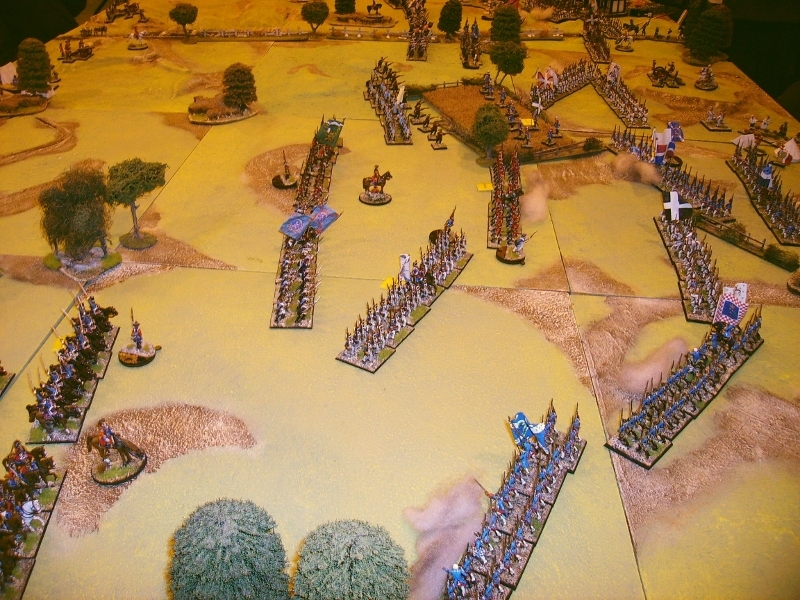 Trading Post's Battle of Camden game. 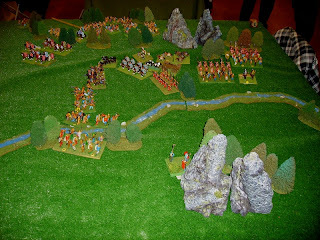 Independent Wargames group's 7 years war game. Hoka Hey's Elizabethan range, quite nice looking! Ah yes, there are Brain Candies Zombies lurking in a corner! We were all glad to see Phil (left), not working a Saturday for once! So, replete with lats of goodies, we left, the cloud was STILL there! My apologies for the many traders and games I haven't featured, there were some good games I didn't get photos of, especially the WW2 ones...blame the yellow lighting!...and my forgetfulness! We did a curious battle in the Ardennes forests today, with a French division facing a German one. Lawrence acted as an umpire, allowing the game to be played with hidden movement, great for building tension and confusion, bad for taking pictures! The terrain was a bit makeshift, most of our club terrain being for 28mm! - as we are fighting in the Ardennes, all the 'Woods' bases are actually clearings, all the standard dark green cloth is woodland! The view from the other end, where the French right and German left would be. The centre of the table, a scene of intense, but unseen action!!! -The French plan was to send my single 84eme regiment up the right in this picture, while Ian, with 1, 43, and127eme regiments on the left of this picture, assaulting our objective, a town. I moved Infanterie regiment 84 up a road on the right of our deployment area, where three of my compagnies saw some scouting German horse on the road ahead. The Germans were dispersed, and neither caused or took significant losses. They rapidly deployed out to probe the flanks of my position. ..and saw the front of my 1eme battalion. My French brought machine guns up to reinforce my front line, and the Germans brought up a regiment to support their cavalry, taking some damaged from the determined French. More and more Germans appeared..my orders to try and attract the German forces while Ian took the town were working only too well! Both sides called in supporting artillery, but in the woods, casualties were light. The Germans consolidated their front as the French stood firm. They then began to infiltrate round my position. Finally, the german pressure was too great, and the cente of my line was assaulted and destroyed by the fierce German attacks. The Germans swarmed forward looking for the rest of the French. ..under sporadic and dispersed French artillery fire. Ian, serene with the knowledge of where the mass of the French army was! The remnants of my front battalion fell back to the line of my second battalion, but could do nothing to stop the 3 regiments facing me pushing round my flanks. We were becoming very isolated! One final assault went in and my regiment failed its 50% loss test and fled! At this point, Ian, with the mass of the French appeared, ready to take the German artillery and attack the German rear. The Germans were dispersed, and largely unable to react to this new threat. The game ended, it turns out the Germans had left the village Ian took and marched along the table, unknowingly pursued by Ian's French! A good game was had by all, and Lawrence did very well keeping us all in the dark!